The Dotara is a traditional stringed folk musical instrument used to accompany various genres of folk music throughout West Bengal and its neighbouring regions like Assam, Bihar and Bangladesh. But although the term "Dotara" implies two strings, `do` being two and `tar`, string , most instruments have at least four strings. There are regional variations, not just in the way the word is pronounced but also in the construction and therefore the sound. In South Bengal, the instrument is called do-taar-aa while in North Bengal, it is the dotra or dot-oraa. The Dotara, about 24" to 30" long, is made out of the wood of the Chhatim (Devil`s Tree) or the Jackfruit tree. It has a hollowed wooden frame, covered with the tightly stretched hide of a goat or monitor lizard, which acts as the resonator. The cleaned skin is cut into shape and then soaked for at least twelve hours to soften it. It is then stretch over the hollow and pasted on the sides with a paste made from cooked rice. The membrane of the Dotara is called the Chauni. The shape of the hollow that is carved out affects the tonality of the instrument: the sound from a deep wide round hollow being sweeter than that from a narrow v-shaped one. Sometimes a few holes are burnt into the skin for better sound. The body of the Dotara then tapers to a narrow neck and culminates in a peg box,(referred to in North Bengal as Saraswatir ghor or the goddess Saraswati`s home), where four tuning pegs made of wood or bamboo connect to the strings. The strings stretch from the base of the frame, go over the bridge (ghora) on the resonator and up the neck to the pegs at the top. The two strings on the outer sides, that is, the first and the fourth respectively provide the top four notes and the bottom four notes of the scale. The two strings in the centre provide the keynote and are separate only on the wooden bridge on the belly. 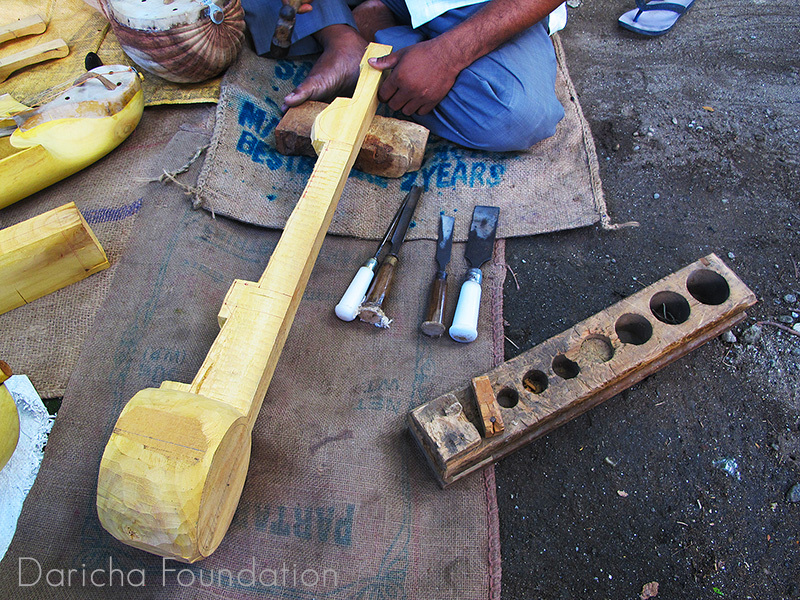 The pitch of the Dotara is regulated by turning the knobs / pegs to tighten or slacken the strings. The bridge is traditionally made of wood (shisham wood or Indian Rosewood being the most preferred since it is long lasting), but camel bone is sometimes used. Variations in the width and height of the bridge alter the quality of the sound. In general, it is the shape of the hollow, the skin and the strings that affect the sound produced. 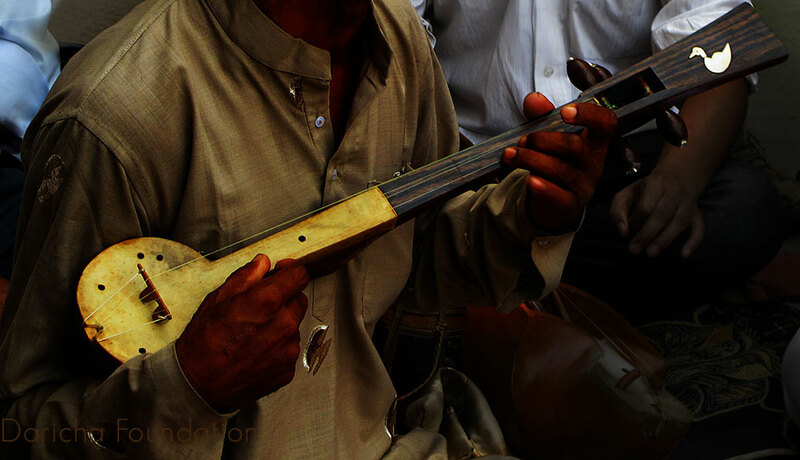 The narrow neck serves as the finger-board, which in the southern variant, often referred to as the Bangla Dotara and predominantly played by the Bauls and Fakirs, is made from metal, laminates or plastic. This particularly lends the liquid form to the tonal quality (as opposed to the discrete quality of a fretted instruments). The peg box in this kind of Dotara ends always in a carving - of usually a bird. Strings in the Bangla Dotara generally tend to be made of metal or twisted strands of muga silk. Metal strings give the Dotara a much brighter tone. The northern variant that accompanies most folk songs from North Bengal, especially the Bhawaiya, is a more rustic form, though some say that in times gone by, the neck always ended in an ornately carved head of a swan or peacock or even a crocodile. The present day dotara makers do not have these skills and so the neck is kept simple. Traditionally, it is made entirely of wood, including the tuning pegs, fingerboard and bridge, while the strings are made of muga silk thread. This gives a bass timbre to the instrument.  These days however, metal pegs, metal clips at the base and nylon strings may sometimes be seen. Additionally, instead of the strings being tied to the knobs, they are passed through minute holes in the knobs and wrapped around it. In ancient times, the strings of the Dotara were made from the spinal column of the Keelback (Dhora) snake. The snake would be killed and buried underground for six months to dry out before the spine was carefully extracted. The Dotara is played with a plectrum known by various regional names such asjawa or guti or nagari. Made of horn or ivory in the earlier days, it is now usually made of wood or coconut shell. In North Bengal, it is difficult to find traditional dotara makers, where the practice has passed down from generation to generation. The makers of such musical instruments are essentially wood work artists, who choose to focus on a particular instrument or instruments, along with other wood work crafts. 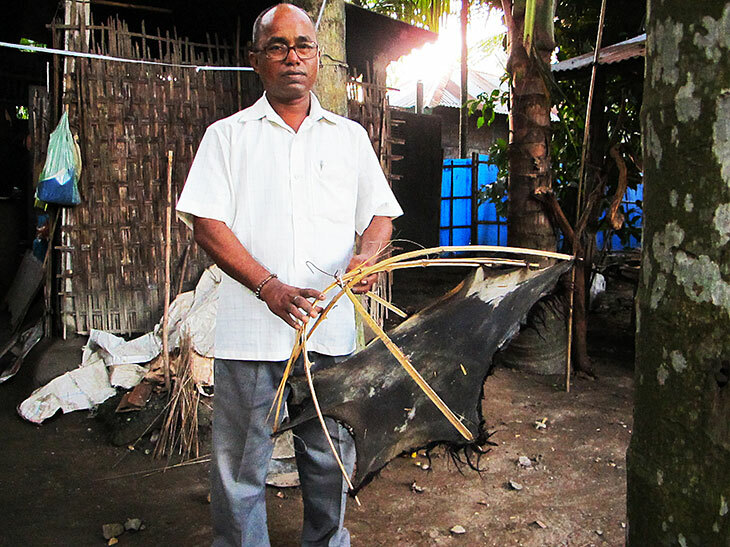 Naren Roy the master dotara maker of Jalpaiguri district is the first artisan who is known to have passed down the tradition to his son.